Does anyone still need to do their Christmas shopping? Of course I meant to do this post weeks ago, but surprise surprise – I’m way behind as always! You guys still love me, right? We aren’t going crazy with gifts this year. I feel like my kids have tons of toys and barely play with any of them. In fact I’ve been organizing and paring down and getting rid of all the stuff they have outgrown or just never touch. I just recently joined our local Buy Nothing group on Facebook, and it is my new obsession. It’s a great way to gift or donate things you don’t use anymore (but that still have lots of life left in them!) – highly recommend if you have one in your area! These days, my kids fight over everything. Sharing is a constant battle, and I refuse to buy two of everything – they need to figure out how to use things together! So this year I’m focused on things that will occupy them at home that they can enjoy (peacefully) together. Here are some of our favorite things right now – some things we already have, and others we’re considering as gifts down the road. I have until like the 22nd to Amazon Prime, right? Hungry Hungry Hippo – the boys got this as a birthday gift this year, and they are OBSESSED. It is the perfect game for them to do together because they each have their own hippo, and they can do it at the same time without waiting for turns. Perfection – this is on our xmas list this year. We played with it at a friend’s house, and it was a great collaborative game that the boys could do together, along with working on fine motor skills and shape sorting. 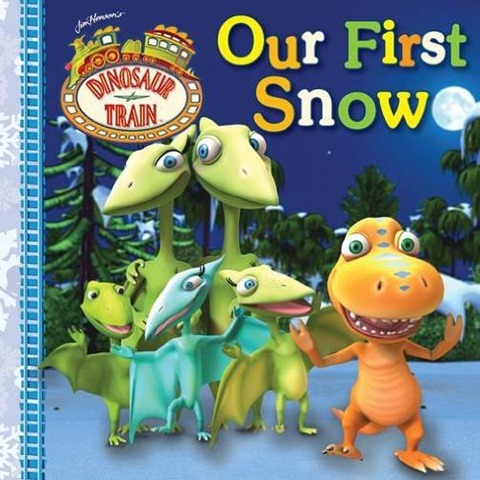 I remember this one from when I was little! Berenstain Bears Learn to Share Game – this one is already wrapped under our tree. My kids LOVE the Berenstain Bears, and we have every book that my mom saved from my childhood. I’m hopeful that the sharing lesson will rub off! MLB Matching Game – Cullen got this for his birthday, and both kids are obsessed. When just Cullen and I play, we do it memory style and flip the cards upside down to try and make matches. When Graham plays with us, we do them face up and see how quickly we can find pairs. It’s a great learning tool, and both kids have memorized almost every mascot and team now – scary. Puzzles – Cullen has always been really into puzzles, even at a super early age. Right now he can do 200 piece puzzles by himself – his favorites are this dragon and this dinosaur puzzle. 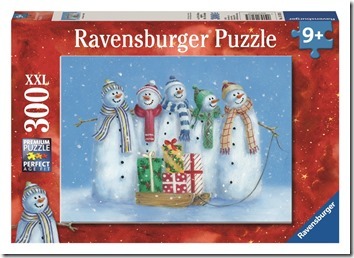 We recently got this 300 piece snowman puzzle, but he likes to do that one with mom or dad. Graham has just started to get into puzzles too, and he can do this 30-piece barn puzzle all by himself now! I love that they love puzzles as much as I do! Micro Maxi Scooter – Cullen got this scooter for his birthday in October, and he rides it nonstop. I got Graham the Micro Mini used off Craigslist, but it’s really beat up and he likes Cullen’s bigger, heavier version much better. So I’m going to re-sell it and get the Maxi scooter for Graham for Christmas this year. It is his big gift for the year! We decided to bring them inside for the winter months, and the kids ride around the house together all day long. I don’t make them wear helmets inside, but outside they rock these Giro helmets for safety. PlasmaCar – we don’t actually have one of these, but I’m always eyeing the used ones on Craigslist. My kids love to ride on stuff, and in the summer we are outside ALL of the time. We’ve used these at friends’ houses and both kids love them. 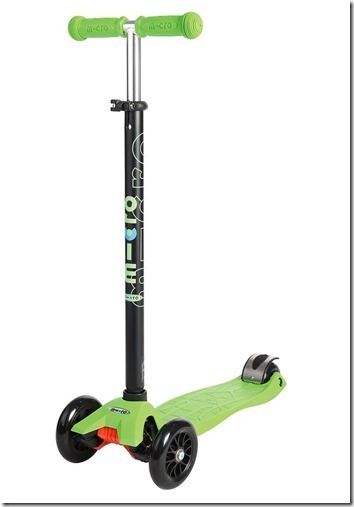 Kettler Kettrike – I scored one of these for $30 on Craigslist last summer, and both kids love it. It’s pricey for a kids bike, but it works way better than any others we’ve used. And it fits both of them so it definitely lasts for a few years if you get it early! I’m trying to avoid getting lots of tiny one-note toys anymore – the kids lose interest way too quickly and I hate all the clutter in our playroom. So instead we’re just adding to sets of toys we already have – I’ve found that the kids are more likely to play with things that have multiple components and accessories to build in different ways. 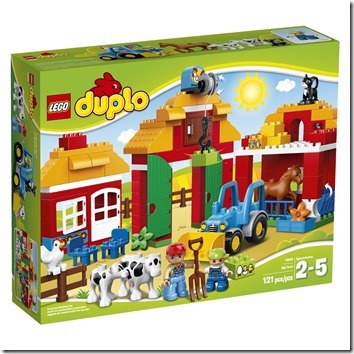 Duplo Building Sets – Cullen is probably old enough to move onto the small Legos, but he still really likes the Duplo sets, and those are better for Graham right now anyway. We’ve been adding small sets here and there for birthdays and holidays, and we’ll get one or two more this Christmas. Favorites in our house are the farm, the fishing set, the fire truck, and the construction vehicles. I really want to get the big zoo, but we’ll hold out for now since it is pricey they are already getting plenty this year. These are another good option to look for on Craigslist! Thomas the Train – we are FINALLY entering the world of trains. Up until now I thought my boys just weren’t really into it, and then I realized that the reason they never played with our trains is because we had ZERO cool train stuff – just two very basic IKEA sets with no accessories. But they love playing with them at toy stores and friend’s houses, and this is the one thing Cullen keeps asking for this year. We are going to start out with a few basic engines, the roundhouse, this tunnel, and the crossing station. I’m super excited about the holiday themed trains – Thomas and the Snowman and Santa’s Little Engine! Update – there is a HUGE deal on Thomas tunnels and accessories today on the Thomas site! I just scored the roundhouse for only $60! Mondo Bloxx – my mom got these for the boys for Xmas, and even though I have NO idea where I’m going to store them (they look enormous! ), I think the kids will love them. We had something like this when I was little and I remember building tall towers and staircases and forts and things with friends. Little Blue Truck Christmas – Graham is OBSESSED with Little Blue Truck, so this one is going to blow his mind. I also got him the LBT plush stuffed animal for him to sleep with. I can’t wait to give it to him! The Polar Express – somehow we don’t have this one yet, so it’s definitely time! Cullen is at the perfect age for enjoying this story. Richard Scarry’s The Night Before The Night Before Christmas – we actually picked this one up last year, but both kids still love it. I Spy: A Candycane – Graham loves these early reader I Spy books, and they are great for him for finding hidden pictures and matching skills. 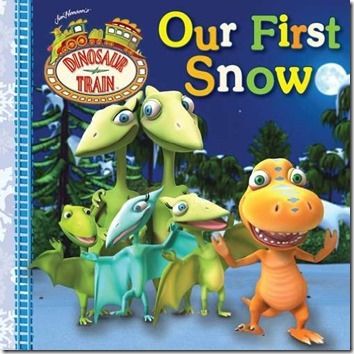 Dinosaur Train: Our First Snow – the most popular show in our house, so naturally we need the holiday book. We get annual membership to most of the kid spots here in Seattle – the zoo, the aquarium, the science center, etc. This year we are also doing some fun holiday experiences like the Snoqualmie Santa Train, as part of our advent calendar fun. We’ll be doing a lot of the free holiday events around the city too – Bellevue Botanical Garden lights, driving around Olympic Manor lights, Greenlake Light the Night walk, Snowflake Lane, listening to Christmas Ship carols, and a few others. It’s fun to live in a city with so much holiday cheer, and it really does make the season feel special with so many new adventures on the calendar. So that’s some of what will be under our tree this year (and other ideas we’ll be saving for later). What are you getting the kiddos in your life this year?? We are decorating our tree tonight and planning to listen to Christmas music and drink hot chocolate. I’ll be back later with pictures of all our decorations and more holiday fun this year. It really is the most wonderful time of the year! And to my Jewish friends – Happy Chanukah! Next Post » Going Nuts. This is our first Christmas with a little one. Our baby is only 3 months, so I am planning a stuffed animal, Christmas book, pajamas, and maybe one other small toy. (All bets are off with the grandparents, though!) As for activities, we are watching the anniversary special for the Charlie Brown Christmas movie on ABC tonight, and have taken the baby AND dog to pictures with Santa. Our dog isn’t tiny either, we have a Catahoula. We were expecting utter chaos, but we actually got a picture without a screaming baby and without the dog trying to climb Santa, so I am calling it a win. I forgot about Hungry Hippos and Perfection–great ideas! We just bought a pass to Kidsquest Museum in Factoria. They are having a BOGO sale right now so my sister and I each got a membership for $50! I’m really excited because they are moving to their new location this spring. We love that museum!! A bit of a haul for us but we go with friends who live in Bellevue every few months. It’s so much better than the one at Seattle Center! I am trying SO hard not to buy stuff for baby (not due until April haha) but it’s hard with all the sales and deals going on right now! I definitely think we’ll want to adopt the want/need/wear/read principle though to keep the amount of stuff down. I also love the idea of investing in memberships, especially for the winter months when I’m sure we’ll be crawling the walls! CONGRATS!! SO exciting!! Babies don’t care about holidays til about age 2, but it’s hard to not get super into it as parents. It’s too fun! Totally checking this out — thanks for the tip!! We picked up The Night Before the Night Before Christmas boxing day last year and have been enjoying it this season. We found a used, in perfect condition, Richard Scarry’s Favorite Christmas Carols with a keyboard this weekend, so that should be fun! He’s library is definitely getting stocked this Christmas. Little Man’s first birthday party was semi-Duplo themed, so we also enjoy adding to that collection. Love the duplo party!! So cute! We got Ada a 1/8 size violin this year for Christmas! And also a bunch of princess dolls because she told Santa she wanted “lots of girls” for Christmas. Hahha Great list. I can’t believe your kids haven’t been into trains until recently. The violin!! SO CUTE!! They honestly just hated our trains because they were boring — can’t really blame them. I think they are going to love the sets they are getting for xmas! Hi Emily! I truly appreciate this post :) question what is a one note toy? Also do you control the influx of toys coming in year round? I swear my kids play with a tenth of what they have and then toys take up so much space! I guess I just mean things that only do one thing without much creativity. Trying to get more building and thinking toys these days. It’s weird for us since the boys’ birthdays are both October, and then holidays a few weeks later — all gifts come in an influx at ONE time during the year. Often I space them out and sort of dole them out slowly, to make them last a bit longer. We don’t really buy tons of toys outside of holidays. 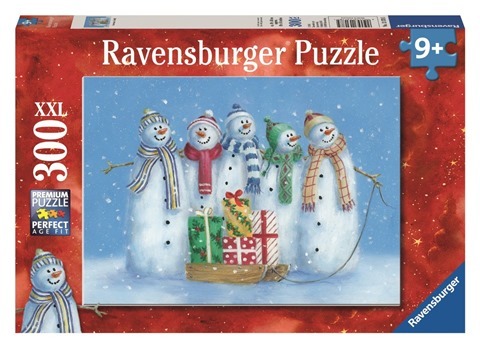 Books and puzzles are year round. Summer we are outside all the time and the playroom gets dusty! Cool ideas! We recently got magnetic tiles (magna tiles) for our 2 year old and he loves them. They seem very expensive but we are getting so much use out of them! I have ordered 4 Dr Suess books for him. He is obsessed with funny sounding words, and Dr suess satisfies him. His current favorite is hop on pop! So much fun to read as well. I love that my son is outgrowing all the typical “toys” and is getting more interested in activity based stuff – building, outdoor play, books. I just ordered some puzzles for him after reading your post! Cullen has Magnatiles and loves them, but Graham still just knocks everything down. :) I hate Dr. Suess — is that bad?? Haha. The books are soooooo long! Thanks for the great list, my son is Cullen’s same age so i always love your suggestions, thanks again! Great ideas! I love hearing what Graham is into since John is just a few months behind (I’m Emily from Cannon Beach). I’m impressed he can do a 30 piece puzzle, adding it to our list! We need some toys to grow into. We got the micro for his bday, and need some more duplos. Thanks! Puzzles are big at our house — Graham is JUST starting to get into it! Pingback: Daily Garnish » Blog Archive » Holiday Gift Guide for Kids (Ages 3 and 5! ).